New stuff coming next month from Speed Hunter Graphics!! 1/32 F-4 early stencils will be sheet #32013. These made me go blind and aged me at least 20 years while drawing them, but man they will look great on your SEA-painted Phantom! Each of these maintenance stencil decals were drawn from actual photos of actual aircraft. In many cases, the same markings on the real jets were white against green paint and black against tan paint, depending on each jet's individual paint pattern. Where this occurred, we've supplied the marking in black AND white. This sheet has specific markings for the F-4C, F-4D, F-4E, F-4G, and RF-4C. Includes decals for weapons pylons, chaff/flare dispensers, and external fuel tanks. I will of course buy the sheet to support SHG, but I can see myself going nuts using them.LOL. Wow, those look nice! And, having done some of my own decals, I understand how those would age you 20 years! I have people clamoring for these in 1/48 and even 1/72. 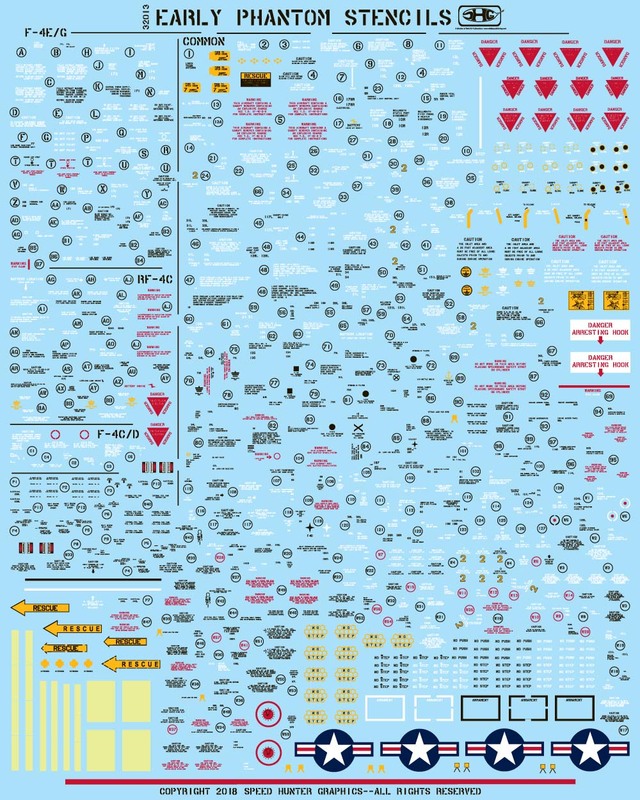 I can't imagine applying all of these to a 1/72 model!!! These came back from the printer today. Just waiting on the instructions to return and I'll get the ordering links turned on. Gotta ask...any Navy Phantom stencils pending? Though I doubt it as I have not seen any USN releases from SHG. So then....the original question is valid! Are stencils being considered for navy Phantoms? Yes. Absolutely. Just need to work it into the schedule and make sure I have thorough reference material to do them accurately.